When you are on the hunt for new, high quality window treatments for your home, you are going to have a bunch of options in front of you for consideration. Window treatments come in all styles, shapes, and sizes, and if you have never been through the selection process before, it can all be a little overwhelming at times. Here at Blinds In Motion, however, we aim to make the process a bit simpler for you by providing you with suggestions, and elaboration on how those suggestions can positively impact your home. Today, we’re going to turn our attention to faux wood blinds, which are an extremely popular window treatment option among many homeowners all over the country. 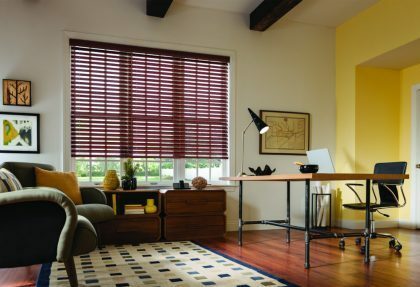 In an effort to help highlight just a few of the things that add up to make new faux wood blinds such a great investment, our team of professionals have taken the time to put together this short list detailing a few of the qualities that add up to make new faux wood blinds a particularly excellent choice when it comes to your home’s new window treatments. One of the most common reasons that homeowners make the choice to invest in new faux wood blinds for their home is due in large part to the price difference between them and their more natural counterparts. Faux wood blinds tend to come in at a much lower cost when compared to natural wood blinds, but are still able to deliver you that same warmth and texture that you want for your home’s interior design that you would get from the real thing. Not only does this mean that, overall, you can expect to pay less in order to get the project complete, but it also means that each dollar you invest in this project is going to be able to stretch that much further. Investing in new faux wood blinds means that for the same price you were going to pay, you will likely be able to outfit more windows around your home. Oftentimes when a homeowner chooses to invest in real wood blinds for their home, they have to be careful in which room they place them, and the kind of conditions that they are exposed to while they are in place. The one big drawback to natural wood blinds lies in their susceptibility to moisture, as over time it can cause them to crack, warp, splinter, and just generally fall apart. This isn’t a weakness that faux wood blinds share, however. Because faux wood blinds tend to be constructed of vinyl, or a combination of real wood and vinyl, they don’t absorb moisture in the same way as their natural wood cousins, and therefore don’t have the same restrictions about where they can be placed. This means that you can safely get that natural wood look you’ve always wanted for your bathrooms or laundry room without having to worry about your new blinds weathering and coming apart. The same qualities that make natural wood blinds unsuitable for any rooms that are overly humid or have have a great deal of moisture in the air tend to be some of the same qualities that can make them difficult to keep clean at times. Faux wood blinds, on the other hand, tend to be remarkably easy to keep clean as you don’t have to worry about exposing them to moisture in the process. Faux wood blinds generally require a quick rinse or a thorough wiping off from time to time as it is needed, and you don’t need to worry about any issues with rotting or warping arising as you do so. Because of the materials and methods used in their construction, faux wood blinds tend to be remarkably durable, and can even last you longer than their natural wood cousins. In addition, you don’t have to worry about the constant exposure to UV rays causing your faux wood blinds to fade and dry out like you would with natural wood. When you make the investment in faux wood blinds for your home, you can have peace of mind in knowing that your investment is one that will last. If you are looking for a shutter company in the Grosse Pointe area, give us a call today at 586-771-8365 or fill out our online request form.